Citizens of Slavonski Brod-Croatia refuse to breathe the most polluted air in Europe contaminated by the oil refinery in Bosanski Brod- Republic of Srpska, B&H. In 2007, the old oil refinery in the Bosnian city Bosanski Brod (the Republic of Srpska) has been sold to the Russian company Zarubezhneft. The new owner put into operation the old processing line of crude oil with the capacity of 1.2 million tonnes per year. Hundreds of citizens of Bosanski brod have been employed by the company. Since 2010 constant exceeding levels of air pollutant emissions have been measured in Slavonski Brod, a Croatian city located on the other side of the river Sava. The air pollution includes high concentration of sulfur dioxide, hydrogen sulfide, ozone and particulate matter (PM 2.5). Slavonski Brod was ranked by the Environmental Protection Agency as the city with the worst air quality in Croatia in 2013. 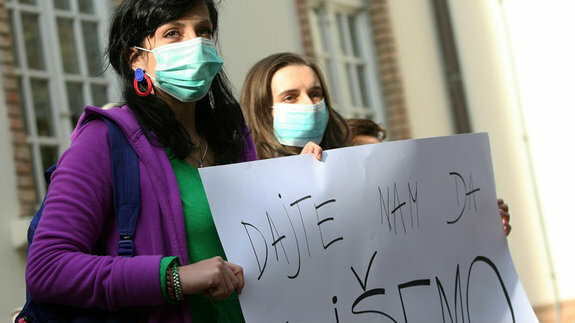 The frequent occurrence of high air pollution provoked strong reaction of citizens of Slavonski Brod as well as the local and national authorities, which organised several protests in their city and in Zagreb - the capital. In April 2013, the Republic of Srpska authorities denied the accusations claiming that the refinery counts with all environmental permits. 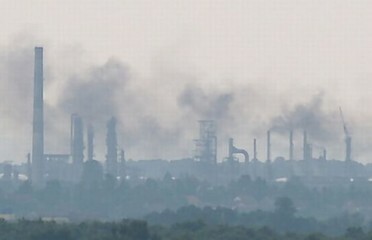 The citizen of Bosanski Brod keep quite on the issue as the refinery is one of the main employers in the area. In September 2013, the Croatia’s Minister of Environment and deputy CEO of Zarubezhneft held a meeting in Zagreb to discuss possible solution to the cross boarder air pollution, when the Croatian authorities proposed modernization of the refinery. However, by the second half of 2014 the air quality in the city has not been improved, bursting in further citizens protests. In September 2014, the Croatian Ministry of Environment formed the specialized body for monitoring of air quality improvement in Slavonski Brod and keep citizens regularly informed on the authorities activities related to this problem. The government of Croatia plan to file a lawsuit for cross border pollution to the European Commission against Bosnia and Herzegovina and Zarubezneft. In 2015 and 2016 the pollution has continued at the alarming level, while the citizens did not stop protesting. In April 2016, the governments of Croatia and B&H signed an agreement on cooperation in the field of environmental protection and sustainable development. The results of this cooperation are still to be seen. However, most likely the pollution problem will be solved only once Bosnia and Herzegovina ratified the EU Treaty of Accession, as currently it is not obliged to comply with the EU regulations. At present, the economic measures could be applied, such as preventing the refinery access to Croatian market and infrastructure. Namely, Croatian oil company JANAF is a main supplier of the refinery. Project Details The refinery processing line has a capacity of 1.2 million tonnes per year. The refinery produces motor fuels, diesel fuels, bitumen, liquid oil gas, heating oil and sulfur. JANAF has signed contract with the refinery in Bosanski Brod on supply of 1.000.000 tons of oil in 2016. Environmental justice organisations and other supporters Citizens initiative ’’Kad ako ne sad. Brođani, ne dajte da nas truju’’ https://www.facebook.com/groups/547634395250618/; GRAĐANSKA INICIJATIVA ZA ČISTI ZRAK Slavonski Brod https://www.facebook.com/GRA%C4%90ANSKA-INICIJATIVA-ZA-%C4%8CISTI-ZRAK-Slavonski-Brod-120625028021963/; Ecological associations "Eko Integral"; International association "Bikers of Europe"; Association of cyclists from Slavonski Brod; Music band "Brkovi"
Other The air pollution from the refinery includes high concentration of hydrogen sulfide 42 µg/m3 (limit value 7 µg/m3), sulphur dioxide 500 µg/m3 (350 µg/m3), benzene 16,2 µg/m3 (5 µg/m3), and PM 2.5 93,1 µg/m3 (25 µg/m3). Respiratory diseases; particular impact on the health of children and elderly. Development of Alternatives The Croatian government and the citizens of Slavonski Brod demanded modernization of the refinery and installing of the air filters. As this did not happen the Croatian authorities decided to inform the European Commission on the case. As Bosnia and Herzegovina is not obliged to comply with EU regulations, the Croatian government might apply the economic measures such as preventing the refinery access to the Croatian market and infrastructure, which would further aggravate its difficult financial situation. Why? Explain briefly. The modernization of the refinery occurs at slow pace and the alarmingly high pollution continues. Uzbuna u Slavonskom Brodu: Truju nas. Gušimo se. Spasite nam živote! Rafinerija Brod glavni krivac za zagađenje Slavonskog Broda? SBTV - DNEVNIK - Novo zagađenje zraka - 19.08.2015. Slavonski Brod: Koga tužiti za to što udišu najzagađeniji zrak u Europi?